After releasing the “Psychedelic Moods” album, in October of 1966, Mark Barkan envisioned another psychedelic album for his next release. It was to be performed by a Greenwich Village band called “Inner Sanctum”. 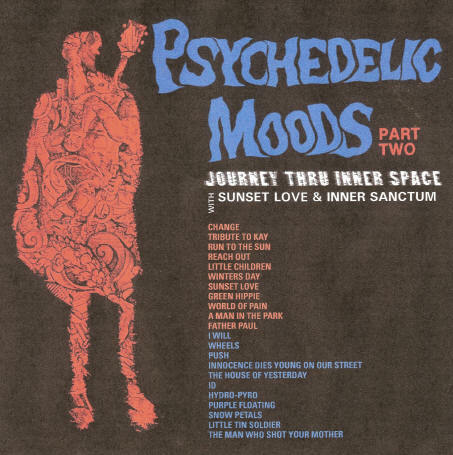 The theme of the album was to be a psychedelic journey into the various psyches of the mind. The trip started with a journey into the past (The House Of Yesterday) then covered the inner workings of the mind (ID) then the descent into madness (Hydro Pyro) hallucination (Purple Floating) and finally culminating in nirvana (Snow Petals). Unfortunately, Barkan was unable to find a record company willing to lease the masters and so they languished for decades unreleased. Now, at long last the masters for this aborted album are mixed from the original four track tapes and forty plus years later the psychedelic sounds of “Inner Sanctum” are now ready, willing, and able to blow your mind. “Sunset Love” was comprised of band members from New Mexico and Texas. In the fall of 1968, thirteen original songs and two covers were recorded for a potential album, but nothing was ever released. “Sunset Love’s” lush harmonies, soaring vocals, superior song writing, and flower power consciousness pervaded their songs with a depth and quality unheard of from most 60s’ bands. While their sound can be compared to such bands as “The Mamas and The Papas”, “The Peanut Butter Conspiracy”, “Spanky and Our Gang”, and “The Love Exchange”, “Sunset Love” had their own inimitable style that transcended a generic stereo-type. Had Sunset Love released their album in the 60’s, there is no doubt it would have been an instant rarity of excellence. The “Sunset Love” tapes are sourced from the original stereo versions and reveal the great harmonies and surrealistic lyrics of an undeservedly overlooked and forgotten band from the late 60’s.